This vintage bird drawing was labeled as being an American Egret or Herodias egretta. It seems that some are now grouping this species with the white heron or great egret. I have seen quite a few great egrets but I don’t really remember seeing too many with such lovely tail feathers. I found a number of historical references to this species of white bird and a number of them mentioned in the early 1900s how they were being hunted to the brink of extinction for their feathers. 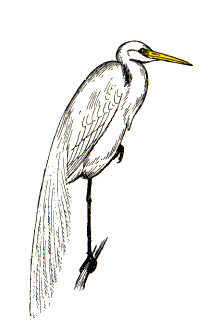 None of the more modern images and photographs of large white heron-like herons or egrets appear to match this drawing or the others of that era. I hope I’m wrong but it would appear the birds called American Egrets are no longer with us except as vintage drawings like this one by Chester A. Arthur.